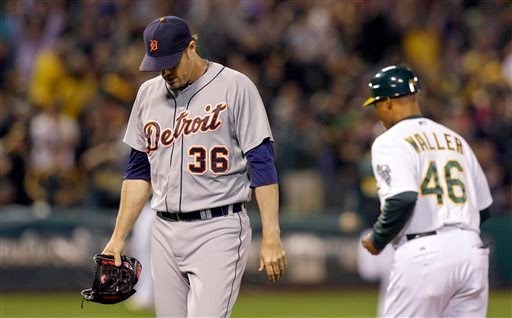 Tigers closer Joe Nathan has a track record, which suggests he will pull out of his current tailspin. Yet, it is nonetheless alarming he has blown four of his 16 save opportunities this season - including two of the last three - and has a 4.58 ERA. Nathan is 39. Pitchers hit a wall at some point. Could that be happening with Nathan, or is this just an aberration? We've seen mixed evidence so far this season. The Tigers had other options at closer, most notably the younger Francisco Rodriguez (32), who leads MLB in saves with 17 for Milwaukee. K-Rod, who had a bounce back season with Milwaukee last season before being traded to Baltimore in a trade deadline deal, got a one-year, $3.25 million (with $500,000) deal with the Brewers as a free agent. Nathan and K-Rod are similar at this stage. Both throw low 90s fastball, but rely on their slider as their outpitch, although Nathan slider is more tightly wound and K-Rod's more a classic 12-6 break. The Brewers originally signed K-Rod, who has 0.93 WHIP, as a setup man for Jim Henderson, who is out. He would have been better closer insurance for the more contention-ready Tigers than Joba Chamberlain, who contract was for $2 million. It's the second time the Tigers have passed on K-Rod. They did last year at the trade deadline. He was traded for a marginal minor league prospect. The Tigers opted instead for Jose Veras, who threw the hanging curveball to Boston's Shane Victorino, which resulted in series-deciding home run in Game 6 of the ALCS. A couple things about Nathan: Manager Brad Ausmus didn't do him any favors by not letting him start the ninth inning Wednesday in the 3-1 loss to Oakland. At 100 pitches, even as well as starter Anibal Sanchez was pitching, he was living on borrowed time. It's not a tough call for managers (although it gets many fans riled up because they want a complete game for the starter). It should be understood managers are always tempting fate by sending that starter out in a one-run game to start the ninth. It puts the closer in a much more precarious spot to enter with runners on base, especially at second, which was the case Wednesday. Frustration about closers has long haunted Tigers' fans. Ernie Harwell nicknamed Todd Jones "Roller Coaster." But it's a description that has fit every Tigers closer from Willie Hernandez to MIke Henneman to Jones to Fernando Rodney to Jose Valverde. Nathan, signed to a two-year, $20 million contract, was supposed to be different. So far, any way, that hasn't been the case. And given the shaky nature of the rest of the Tigers' bullpen, it is discomforting. Pat, I think he won't be bad as 2012/2013 Valverde but not as good as Benoit. He was lucky the first hitter didn't do him in when he threw a 91 m.p.h straight fastball down the middle of the plate. With the comments, I hope he has hit rock bottom and the only way is up. While I agree Nathan has not been particularly effective this year, based on his track record, I think its only a matter of time before he rounds into form. Additionally, as a Tigers fan, having a proven closer in the bullpen is a big relief, blown saves or not.